Page under complete revision. We aim to complete this section by the 30th of August 2016. For as long as there have been tattoos there had been a demand for their removal even long before the advent of modern technology and laser treatments. Salabrasion or salation is the first effective form of tattoo removal and it had been an effective tattoo removal technique for several hundreds years. Originally Salabrasion was used by literally rubbing the tattoo using salt until the upper part of the dermis become exposed to the sodium chloride. Modern technology has not made this technique obsolete as it is still very effective and inexpensive. Skin resurfacing in celebration is key for effectively applying the osmotic effect induced by the sodium chloride. Innovation in aesthetics has introduced new devices for skin resurfacing amongst those are radio frequency or electrical arcing devices. Other devices can be used for effective resurfacing before applying celebration (or Osmosis) ie microdermabrasion devices, micro-needling devices injecting the saline salt solution directly into the dermis, certain specialised cosmetic peels and any method currently known to expose the upper dermal layer to the action of the alt This can be coupled with order treatments to There are several. Why Radio frequency or electrical arcing for skin resurfacing before Salabration? The radio frequency or the electrical arcing devices have the double function to remove the epidermal layer and also heat up and break down the tattoo pigments at the same time. 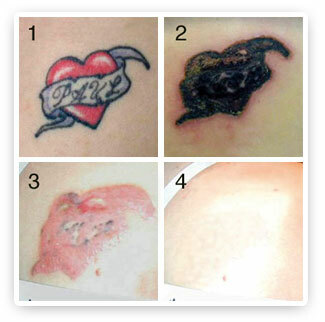 There are different radio frequency devices or electrical arcing devices with the intended purpose of tattoo removal. The electrical arcing ablation can be carried out at different intensities. Also, radiofrequency devices or electrical arcing has the double effect of not only performing the required skin abrasion necessary for the osmotic effect to take place but it also breaks down part of the tattoo pigments (like lasers do) which contributes to speed up the tattoo fading process. The first level of intensity consists in simply removing the epidermis. This is done by setting the specific device at very low power levels to ablate the epidermal layer and then removing with a cotton pad impregnated with non-flammable antiseptic the carbon residues until exposing the upper dermis. This alone will suffice to then apply osmosis either by applying sterile salt or a sterile salt paste. A level number to is removing the epidermal layer and then spraying quickly on the upper dermal layer. This has the function of breaking down the tattoo pigments inside the dermis. However as we know, the tattoo pigments can be also distributed relatively deeply inside the dermis therefore the a degree of deeper ablation can be required in order to have an impact on the deeper pigments. In order to do this usually a double pass is performed on the upper dermis. As this is done normally the part starts bleeding. Please bear in mind that the deeper the ablation the higher the likely hood of permanent adverse effects including scarring. Usually it is the tattoo removal practitioner the one how decides the degree of ablation. This is done according to the client’s desires and his own previous experience. For example, if the client is happy incurring in a higher likelihood of incurring into scarring but going through fewer treatments then a higher degree of ablation can be carried out. Also, the piments can be reached inside the dermis with a single ablation. By setting the device at the relatively high power the arc has the function to also reaching the lower part of the dermis. 1 applying a dense paste made of sterile saline solution and sterile fine sodium chloride. This has relatively high-intensity results if compared to applying only sterile fine salt. 2. Applying sterile fin e salt on its own. The duration of the sodium chloride application has a direct impact on the intensity of the treatment. The longer the salt is applied the higher the treatment intensity and the more the osmotic effect on the tattoo pigments, therefore the more the fading of the tattoo after each session. The salation has the effect of drawing up the colour pigments toward the surface of the skin. The longer the sodium chloride is left on the part the more the colour pigments are drawn towards the surface, therefore the more the tattoo will fade. Keeping the time of application the same the two different osmosis methods have different osmosis intensity. Generally, the sterile sodium chloride paste has a stronger efficacy than fine sterile salt. This is why it is used for permanent make-up removal. In permanent makeup removal it is not practical to bandage the area treated due to the location of the tattoo, therefore the sterile paste is applied so that the osmotic effects are so effective that the application is only a few minutes in order to achieve the desired result. The devices used for Electrical Thermabrasion. This depends on eh overall intensity of the treatment. The higher the intensity of the treatment the longer the part will take in order to recover fully. Usually the scab form within 3 to four days from the treatment and falls off on its own accord with 10 days front eh treatment. However, the area may still feel tied to the touch in or tender in general up to a few weeks after the scab has fallen off. Generally the healing time, provided that the area is not infected, is a maximum of 10 days and it is market by the scabs falling off on their own accord. The main adverse effect are infections. One of the main differences between this type of treatment and laser tattoo removal is that with Thermo abrasion the likelihood hood of contracting an infection are higher. This is because the treatment will effectively leave an open wound which during the healing period is susceptible to localised inflammatory infections. The likelihood of infections are easily minimised by using the appropriate aftercare and keeping the area clean until the scab have formed fully. Once the scab have formed the likelihood of contracting a localised inflammatory infection is very low because the scab forms an effective barrier. The scab must not be removed forcefully. These scabs are usually relatively thick and sometimes contain a relatively large amount of the tattoo colour removed by the procedure.. however are very easily avoided. In this picture, we can see a small hypertrophic formation of the are treated with Electrical arcing and osmosis. In this particular case, the area was on the waist line and an infection had occurred. This small hypertrophic formation disappeared in weeks on its own accord. A Common adverse reaction of samabration is the formation of a temporary hypertrophic scar. This forms especially if the area has been subject to an infection. Usually, this hypertrofic formation subsides on its own. So far no cases of hypo pigmentation have been reported. The main adverse reaction can be scarring witch can happen if the treatment has been carried out too intensively or the part has contracted an infection. Although the former eventuality has rarely reported being the cause of scarring the latter is more likely to produce scarring. This is because the prolonged infection can cause sometimes even sever damage to the dermis, hence causing the scarring. Hyper pigmentation is also possible after the use of this aesthetic technique, this is because this involves the skin regeneration and skin resurfacing. All skin resurfacing treatments require total sun protection in order to avoid hyper pigmentation. Hence, in order to minimise this likelihood, the client must avoid direct sun exposure while applying sunscreen an up to three months after the last treatment. The tattoo fades depending on the type of tattoo see kirbey Desai scale. And mainly also depending on the overall intensity of the treatment. Usually the higher the intensity of the overall treatment the more the pigments are drawn inside the scab. 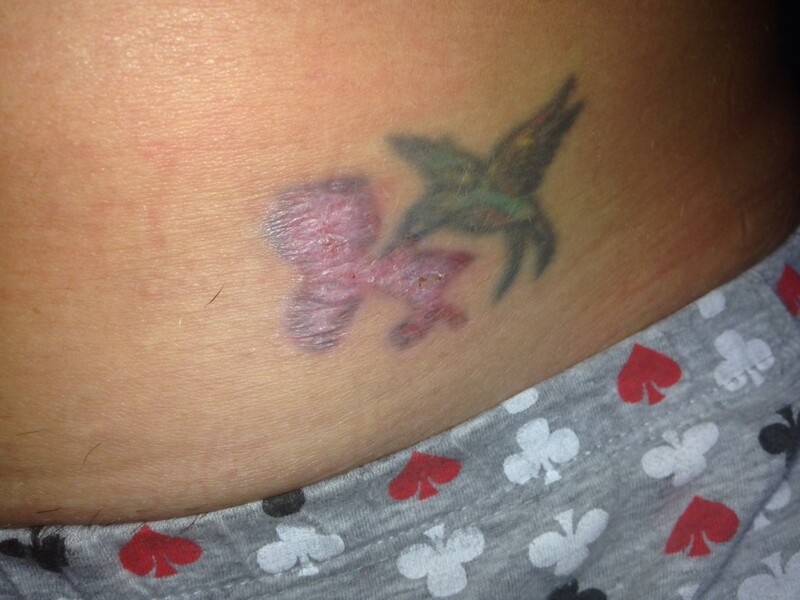 Usually the scab will visibly contain the colours of the tattoo that has been treated. The higher the intensity of the treatment the more the pigments inside the scab. It is not unusual to see scabs containing green , , yellow and blue colours after the treatment of multicolour tattoos. the osmosis intensity the beauty professional has more control over the amount of ink being reduced after each treatment. The oomosis will have th e second effect on the tattoo to draw the pigments out to the surface, This coupled with the healing process has usually dramatic fading effects on the tattoo. The longer the sperile sodium clhoride is kept on the treated area the stroger the osmosis effects and the mor eth epigments will be drawn to the surface. Conseqintly the more the tattoo will fade. As we have seen tattoo are all different. The usual rule of the higher the points on the quirky Decay Scale the more challenging the tattoo will be to be removed, and like in case of laser removal treatments, it is sometimes impractical to achieve complete removal of the tattoo without leaving a scar. However, most tattoos are often removed more easily than lasers due to the double fading effect of electrical thermabrasion and salation. The average treatments required varies between 3 to 5 for an average tattoo. How much of an area can be treated at a time? In general the medium intensity treatment fades a greater degree of tattoo pigments than most Q-Switched lasers. Since this type fo treatment is colour blind it is one of the preferred methods to fade multicolour tattoos. As we know multi colours tattoos are very challenging to be faded with lasers.Some colours cannot be fades by lasers at all. This is not the case with salation and theremabrasion using electrical plasma as this type of treatment is colour blind and tends to fade al colours indiscriminately. It is not unusual to see scabs literary gree of yellow depending on the colours of the original tattoo.